from his Lower East Side neighborhood. and these moments became the foundation of his invisible city. a remarkable achievement of personal vision emerges. (4:59) book trailer for Invisible City with music by Live Skull. Published by Steidl, 2nd edition, 2nd printing 2016 Göttingen, Germany. 1st edition Twelvetrees Press, 1988. Pasadena, California. 80 pages, 62 photographs. Texts by Lewis Mumford, Jorge Luis Borges, Franz Kafka, George Orwell, Jean Baudrillard. 9.1 x 6.81 in. Design by Ken Schles and Jack Woody. Matthew Carson, Russet Lederman and Olga Yatskevich, eds., New York, U.S.A.: 10×10 Photobooks and bookdummypress, 2013. 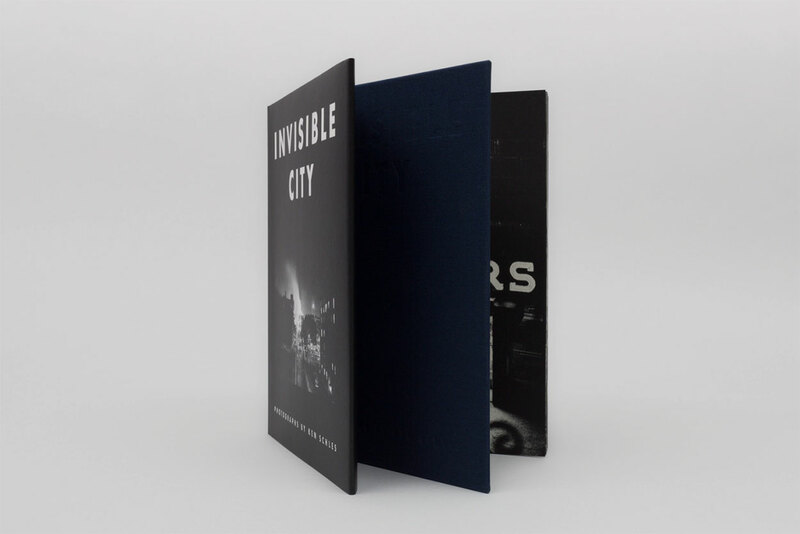 A New York Times notable book of the Year (1988) and awarded by the AIGA for book design, Invisible City also appeared in 802 Photo Books from the M + M Auer Collection, a compendium of books important to the history of photography. 1992 saw Invisible City exhibited in More Than One Photography at The Museum of Modern Art, an exhibit that surveyed the range of photographic use in contemporary art practice. While the book shared space with works by Rauschenberg, Warhol, Keifer and many others, it was the sole representative of the published photographic book. Cited in the seminal Parr/Badger The Photobook: A History Volume III , and noted twice by photobook experts in 10x10 American Photobooks, Invisible City was warmly received upon its republication as a book of the year in TIME, Mother Jones, Vogue Italia and The Daily Beast after a 26-year hiatus. Along with Night Walk, Invisible City was nominated for the 2016 Deutsche Börse prize, and has proven its place in the canon of the photographic book. 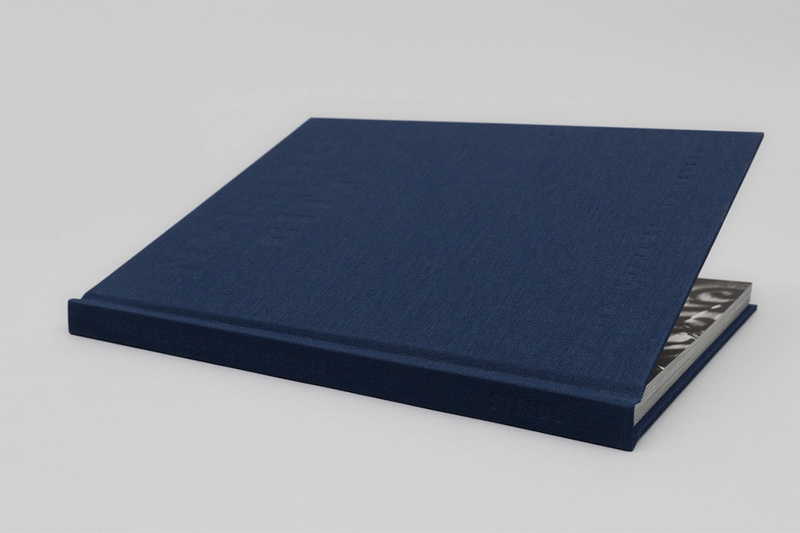 Note: Copies of Invisible City and Night Walk sold on this site are from the 1st Steidl edition printed in 2014 (now out of print). There is a nominally higher price over list. The Daily Beast best photobook of the year (2015): "Visually stimulating and incredibly powerful..."
TIME photobook of the year (2014) "The reissue of Invisible City is rich in texture and is every bit as intoxicating as that first visit to Schles' East Village in New York City in the eighties." — Michelle Molloy, International Photo Editor, TIME. A New York Times notable book of the year (1988). "Perhaps one of the greatest portrayals of nocturnal urban life of the 20th Century -- certainly keeping equal company with Brassai's classic Paris de Nuit." — Eric Miles, Photo-Eye. A "worthy addition to the canon." — Gerry Badger/Martin Parr, The Photobook: A History Volume III. "Both books are of enormous force. So intimate and direct, that it sometimes pains the eyes. They are marked by a lust for life out of control." — Freddy Langer, Frankfurter Allgemeine Zeitung. 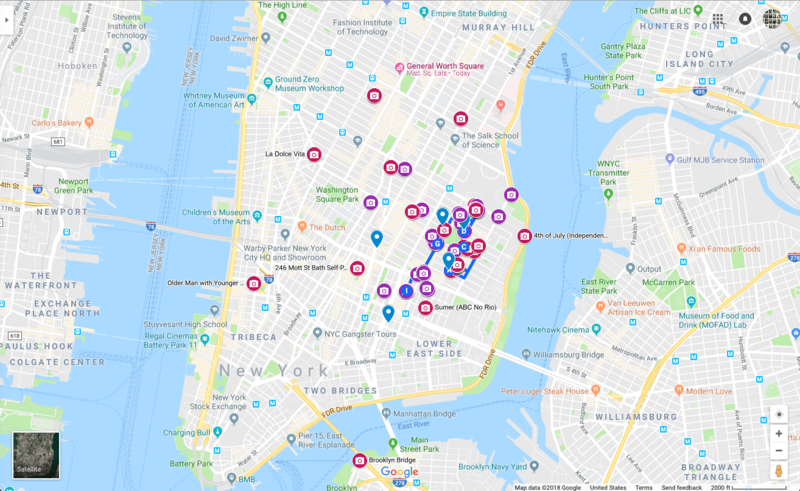 "Together with Night Walk, these two volumes are must books for those interested in New York but more, to anyone interested in the edge of life." — James Wellford, Vogue Italia. "Pictures like this speak to the gut. They isolate time from itself. Bottom Line: A re-issued classic, straight outta the NYC 80's." — Jonathan Blaustein, from the blog A Photo Editor. "hellishly brilliant." — Vince Aletti, The New Yorker. "Steidl ends the year with two masterpieces: Henri Cartier-Bresson's The Decisive Moment, and Ken Schles' Invisible City. Even if you agree with some of his critics, you have to admit that Cartier-Bresson's book is very beautiful. Ken Schles' Invisible City is an extraordinary production, printed in five inks using a special screen to mimic as closely as possible the original photogravure. An important book made available again for a new generation of photographers (and for those of us who were a bit distracted at the time)." — Cuatro Cuerpos. 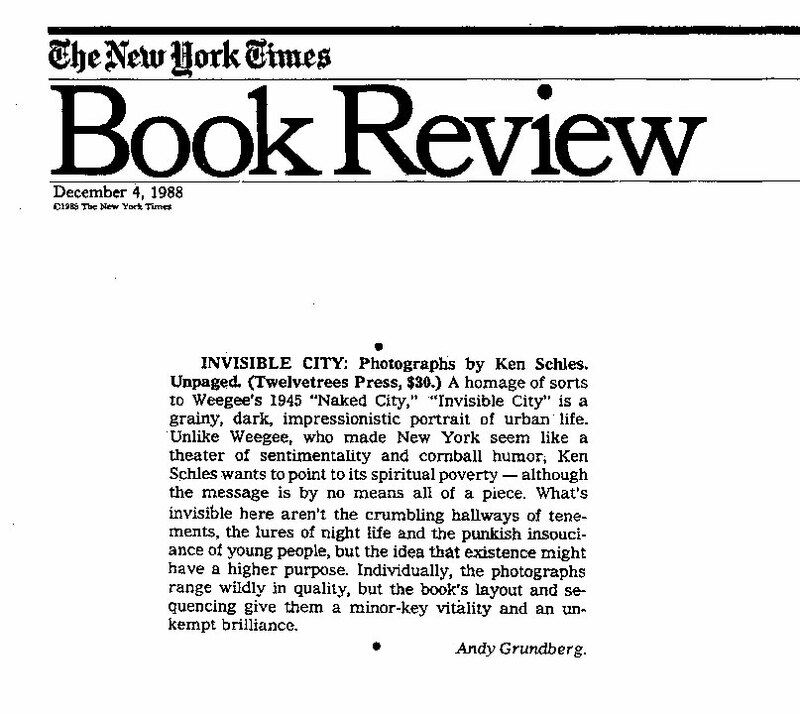 "What emerged was a bounty of startling black-and-white images, both bleak and ravishing, that were so starkly truthful about that time and place that their publication as Invisible City in 1988 would become a landmark cult title, unavailable for over two decades. Originally published by legendary Twelvetrees Press in Pasadena, the book was printed on a photogravure press, now virtually extinct. If ever there were a book that could not be anything other than black and white, this was it. The riveting tonalities are the reality of Schles's naked netherworld. 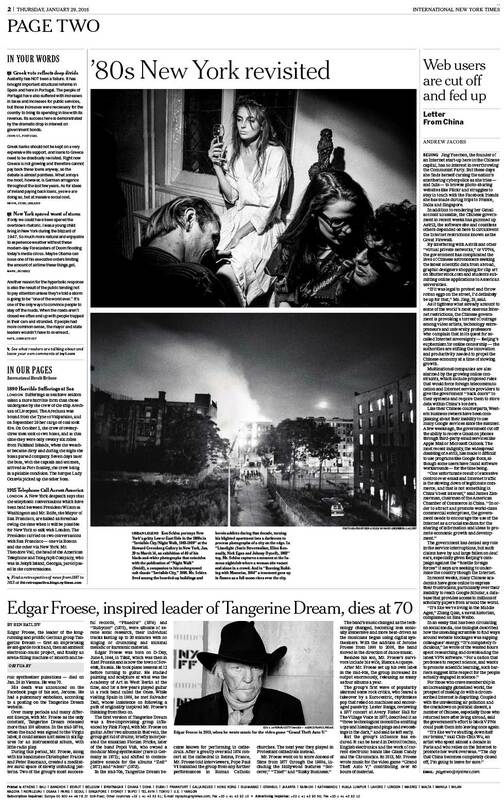 His camera managed to memorialize a now-mythic era of New York history that for him at the time was merely "the reality out my front door." " — Michael Kurcfeld, The Los Angeles Review of Books. 5/5★ "Poetic and direct. Raw and dark. A brilliant portrait of a city in decline and the people living in it." — Rianne van Dijck, NRC Handelsblad (The Netherlands). And later, the show at Noorderlicht was selected by the same journal in its year end best of the year. 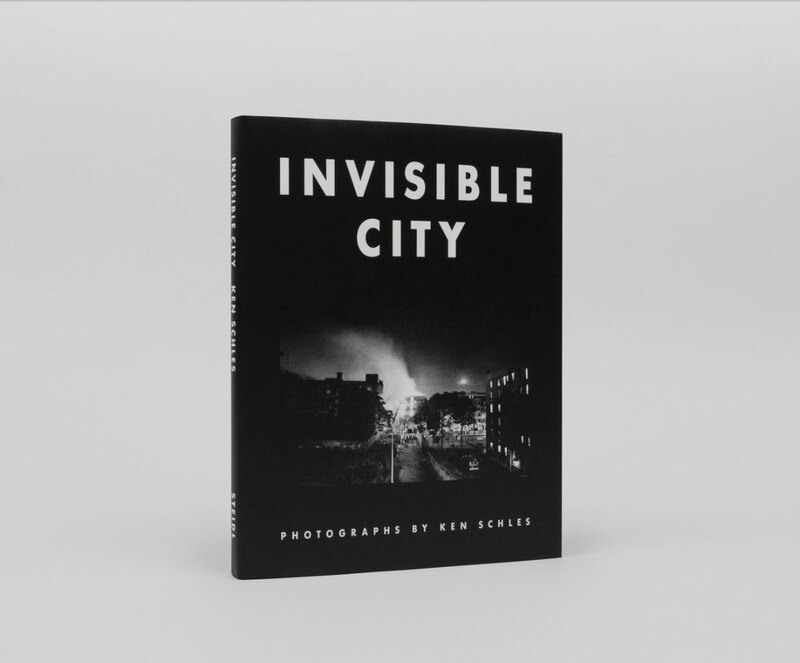 And have a look at Ken Schles: Invisible City, a digital resource. A free crowd-sourced eBook study by the Photo Book Club (UK). Includes interviews and other background material.